Secure, Reliable backup with fast seamless restoration all at your fingertips. Email Phoenix allows you to backup and restore your Kerio mail store all from within the app. If your mail server goes offline, just simply activate Kerio on your backup server and you are running. When your primary server comes back online, simply click the restore tab and return the mail to it’s proper place. Email Phoenix is only $30/month! This sounds too good to be true – is it? Of course it’s true. Email Phoenix will sync your data to your backup server so you never have to lose time or money when your server is offline. How Does Email Phoenix Work? Email Phoenix uses secure technologies to transport your Kerio Connect data to either your server. You install the app on your source computer (the one running Kerio Connect). You connect to your backup server and you click Go. That first backup will take time, but you can close the program and let the service run in the background. You can log into your backup server to see the data flowing but we also suggest running your own fire drill to test. DNS is a database system that translates computers fully qualified domain name into an IP address. Essentially it converts the words mail.yourdomain.com into an IP address of your mail server. Manually – go to your DNS host and change it, the speed of this will depend on the TTL for your DNS host. Use a round-robin service like dnsmadeasy or dyndns. What is needed for the Email Phoenix to work? Click GO!. If you are using Windows, the Email Phoenix application will say permission denied and rerun the script – this time use the proper IP and winroot password. Once GO! has been clicked you can close the application as the ’emailphoenixservice’ will be running. What gets backed up and restored? 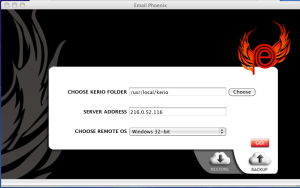 Email Phoenix backs up certain parts of your Kerio Connect installation. Included is the user configuration file, the mailserver configuration file, the license configuration file, the SSL folder and the mail folder. This allows for your remote Kerio Connect installation to keep running. On the restore all of the same files except the mailserver config file are restored. This is because if you cross platforms and change the mailserver.cfg, you don’t want to accidentally overwrite the original file. Note: The backup folder and archive folder do not get backed up in either instance of Email Phoenix. Only the Mail folder inside the Store directory is transferred. I’m getting a “Permission Denied” error. Help? Quit the Email Phoenix app. Right click the Email Phoenix application and choose Show Package Contents. Double-click on Contents. Double-click on MacOS. The id_rsa and id_rsa.pub files are in there. Move them to your trash. Quit the Email Phoenix app. Click Start. Click My Computer. Double click C:/. Double-click Program Files (in a 64-bit Windows OS, double-click Program Files (x86)). Double click the Email Phoenix folder. Double click the bin folder. The id_rsa and id_rsa.pub files are in there. Delete them. When you restart the Email Phoenix application it will rerun the script and you can fix your permissions. What if my store directory is not in the Mailserver folder on the main server. What if my store directory is not in the Mailserver folder on the backup server? Can I run both my main server and backup servers Kerio Connect at the same time? To guarantee the data transfers from your main server to your backup server you should not be running Kerio Connect on your backup server until you need it. Also, according to Kerio’s Terms and Conditions of their licenses, your license is for “one instance” of your server. This means you can only run one server at a time. We suggest having Kerio Connect installed on your backup server, but turn the service off. On a Mac how do I use my own logos inside the app? On a PC how do I use my own logos inside the app? What if my company uses Active Directory or Open Directory? If your Kerio is attached to your directory system (Active for Windows, Open for OS X), and your directory is offline your users will not be able to connect. Email Phoenix will transfer the data, but your backup server would need to be able to talk to your directory system for password management. I’m using Email Phoenix and backing up to a different platform. Do I need to change anything on the remote server? How do I setup Windows for SSH? Open Windows Explorer. In Windows Server 2003 choose Start Menu -> Windows Explorer. In Windows Server 2008 or 2012 click Windows Explorer from the taskbar. Change “From this location:” to the local computer name. Launch MobaSSH, and click the Users button. Click Apply Users if it’s highlighted. If the MobaSSH is running while this was done – click Restart to restart service. NOTE: You can test if this worked by opening an SSH session to your windows box by typing in ssh winroot@IPADDRESS from a machine that has a SSH-client. Ready to Save your Company?